I've been a fan of Brant Hansen's writing for quite a long time. I can still remember my first encounter with his words over a decade ago: a blog post declaring that he and his family were giving up church attendance in favor of a different sort of gathering with other people of faith. At that time, he kept a blog called Letters From Kamp Krusty, where he sometimes poked fun at the strangeness of church culture, at other times tackled more serious issues such as acceptance and doubt, and at other times engaged in outright silliness such as singing (sometimes literally) the praises of toast. What I always noticed and appreciated even in those earliest days was Brant's repeated observations that many Christian circles don't often know what to do with those who don't quite fit the mold. It's easy to welcome and accept and engage with the ones who seem well put together, those who carry themselves confidently or who are articulate about faith issues. It's more difficult to do so with the shy or awkward, those struggling with disorders or disabilities, the ones who dare to express doubts or questions. In that sense, Blessed Are the Misfits: Great News for Believers who are Introverts, Spiritual Strugglers, or Just Feel Like They're Missing Something is a culmination of what Brant has been writing about for years. The warning he includes at the very beginning (partially quoted above) names that he wants to speak to all those who have often or always found trouble trying to relate to fellow believers in traditional contexts or ways. Much like the title, many of this book's chapters follow the model of the Beatitudes in the Gospel of Matthew, declaring various groups of misfits "blessed." He addresses groups such as those who can't easily access their emotions, those who struggle with prayer, those who struggle with "imposter syndrome," skeptics, and those on the autism spectrum, among many others. Every chapter provides a combination of personal anecdote, scriptural insights, and assurances that one shouldn't feel so alone; that in fact there are many others wrestling with similar issues, and that God loves them all regardless. Brant is quite open with his own struggles throughout his book. As a self-identified introvert, skeptic, and "Aspie" (person diagnosed with Asperger's Syndrome), he weaves his own story into many chapters. This is not a memoir per se, but one of the reasons he wants to include and reassure many of the groups that he does is because he falls into them himself. He knows the issues well, and his form of self-confession and exploration allows the reader dealing with similar things to enter into what he shares more easily. 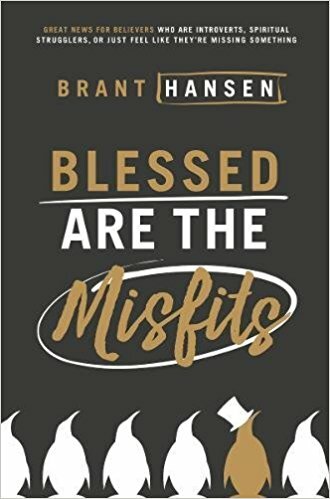 I found Blessed Are the Misfits a wonderful exploration of why so many don't feel like they fit into traditional church culture or ways of expressing faith. He helps show that such things don't mean they aren't or can't be loved by God. In fact, he says, we often see that Jesus tends to spend more time with the outcasts, the square pegs in the culture's round hole, who have been deemed unfit, unclean, and unworthy. As he has been doing for years, Brant wants to show that what was good news for Jesus' original audience is still good news for many who need it today. Blessed Are the Misfits releases on November 28, 2017.